The Pontoon Paddle Boat Lift with deep water kit is designed for water depth up to 5 ft. It's perfect for storing the paddle boat or compact pontoon up out of the water while not in use. The aluminum jack on each corner of the lift is operated individually using a 3/4 inch wrench or socket with cordless drill to effortlessly raise the boat. The frame work includes eight Bunk Pads that allow the underside of the boat to glide into position. A bumper is included for each Jack support to protect the boat. All aluminum frame construction bolts together quickly and easily. The Double-Wide Watercraft Bunk Lift measures 10 ft. wide by 8 ft. long and has a lifting capacity of 1200 lbs. The lift includes eight bunk brackets to add two pair of wooden bunks (lumber material not included). This manual lift is an excellent option for raising your compact pontoon boat, paddle boat of PWC ft.s up out of the water for dry storage. The Double-Wide Watercraft Lift uses stationary legs on the shore end of the lift that are set to the desired raised height while the lake end of the lift is supported by aluminum screw jacks that raise the rear of the lift to the storage position. Operate each jack incrementally to raise the lift up to the storage position. Includes manual hand crank or the jacks can be operated using a cordless drill with 3/4 inch socket driver. The Pontoon Paddle Boat Lift with shallow water kit is designed for water depth up to 3 ft. It's perfect for storing the paddle boat or compact pontoon up out of the water while not in use. 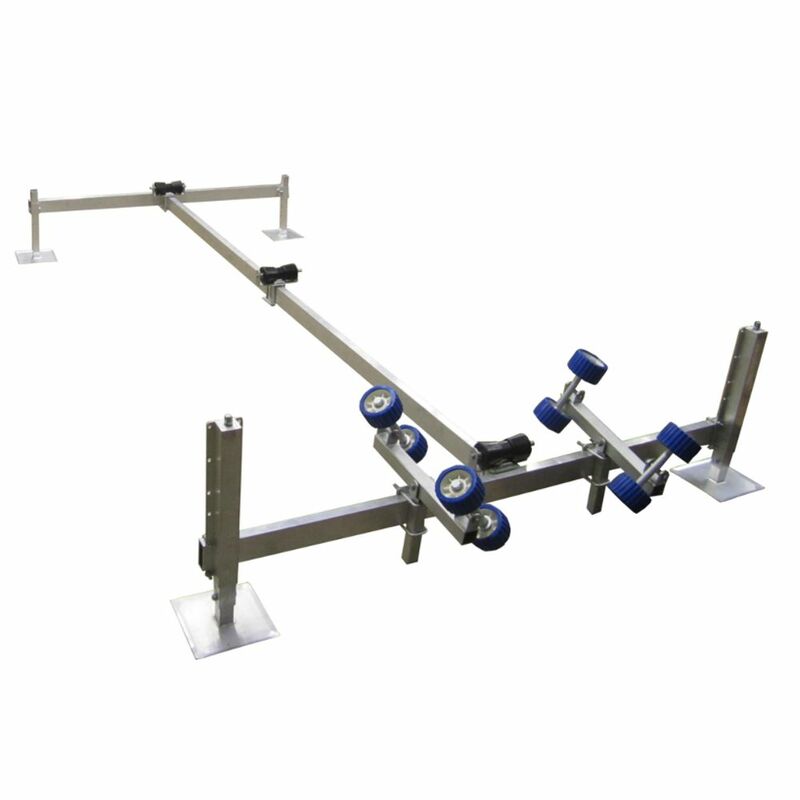 The aluminum jack on each corner of the lift is operated individually using a 3/4 inch wrench or socket with cordless drill to effortlessly raise the boat. The frame work includes eight Bunk Pads that allow the underside of the boat to glide into position. A bumper is included for each Jack support to protect the boat. All aluminum frame construction bolts together quickly and easily. The Single Watercraft Bunk Lift measures 5 ft. wide by 8 ft. long and has a lifting capacity of 1200 lbs. The lift includes four bunk brackets to add a pair of wooden bunks (lumber material not included). This manual lift is an excellent option for raising your fishing boat or PWC out of the water for dry storage. The Single Watercraft Lift uses stationary legs on the shore end of the lift that are set to the desired raised height while the lake end of the lift is supported by aluminum screw jacks that raise the rear of the lift to the storage position. Operate each jack incrementally to raise the lift to the storage position. Includes manual hand crank or the jacks can be operated using a cordless drill with 3/4 inch socket driver.